One way to upgrade your catalog of songs is simply to strip them down to just vocals and your first love. Howard Jones, singer and songwriter of so many 80s hits that sometimes also sound so 80s, launched a thoroughly original idea into his Solo – The Songs And The Stories tour that features just him and the instrument he first started on – the piano. That’s it. No band, no guitars, drums or the ever present synths in all those popular favorites. 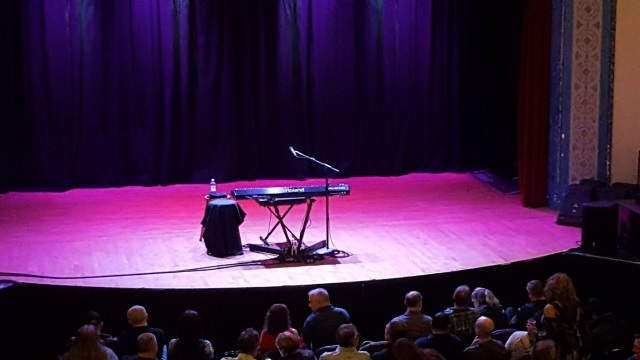 Granted it wasn’t an actual piano, a keyboard selected to piano which worked just fine as Jones sat stage front on a chair just a few feet from the front row. The atmosphere felt part talent show setup blended with VH1 Behind the Music and an all-star caliber musician who was charming, self-effacing and quite witty. Of course, the sell-out crowd at the Aladdin Theater on Thursday in Portland loved every minute of it. It was much less a concert performance and more of a stage show offering reminiscing memoirs enveloped with music. Prior to starting Jones thanked the audience for coming and thanked those in attendance perhaps slightly against their will. “I’m there for you tonight,” he said to laughs. He played, obviously, but mostly chronicled through a 12 song setlist that included such smash tunes like “New Song” and “What Is Love” but also some solid fare radio never picked up and even a song many probably never heard before. The music? Quite distinctive actually. His vocals strong 30 years after his days of selling out arenas and you know he can sing, actually sing, because he sounds good. Raw but polished, no mic effects and no other instruments to compliment or cloud a minimal vocal range. It was like hanging out in his living room while he dazzled and entertained on piano then turned around to those sitting on the couch to explain the meaning of the song or recall an experience with another. Most of the songs took on new life without the full accompaniment of melodies that turned them into chart topping successes. The pop was gone but the framework intact as Jones began the evening with “You Know I Love You, Don’t You” followed by “Specialty” and then a nearly replicated performance of “Hide and Seek” from 1985’s Live Aid concert included a beautiful piano strain. The evening included his many hits like “No One is to Blame,” “Everlasting Love” and “Things Can Only Get Better” the lone encore track. “Soon You’ll Go” the album closer off 2009’s Ordinary Heroes probably got a spike in downloads or streaming from the Portland area and his rendition of George Michael’s “Careless Whisper” was stirring and compassionate to the man Jones called “ a very lovely man” who was the British artist of his generation. Despite the butterflies and second guessing, when Jones played “Hide and Seek” in front of tens of thousands who roared back the chorus, he said it’s an experience he’ll take to the grave. It’s that nervousness he said, that keeps him coming back. You can perform a thousand gigs but it’s the next one you want perfected, he said, admitting an addiction to that thrill. “Soon You’ll Go,” originally recorded with the Morriston Orpheus Choir, is Jones’ effort to express his excitement about his daughter leaving for university as well as the loss of her leaving. He spent years trying to work up playing the song live without breaking down during the chorus. He did just fine. Remember the film “Eddie the Eagle”? Jones provided a song called “Hero In Your Eyes” and if you want to hear it come to his show. It’s found nowhere else other than quietly in the background during a portion of the film. It was refreshing and a whole nother experience that artists should take note of. Jones might have fell a bit off the radar after his 80s heyday but he’s never stopped writing and recording. Jones recently celebrated the release of Best: 1983-2017 but remains busy with a new album and plans for more touring though with the full accompaniment.